Some people who are searching for employment seem to get employed immediately, while others remain on the job search for months or even years. What makes one candidate so attractive to employers, and why can’t the other job seeker get a job offer? The answer may lie in the way the prospective employee handles the job interview and follow up correspondence. Job interviews are extremely important, and it is equally important to write a thank you letter after an interview has been conducted. Here are several key tips for potential job seekers to follow when writing an after interview thank you letter. Begin working on the letter soon after the interview. Ideally, after-interview thank you letters should be sent within 24 hours of the time the interview was conducted. This helps to ensure that the employer matches the name with the face, and it helps them to remember a candidate in the scores of other applicants and job candidates. 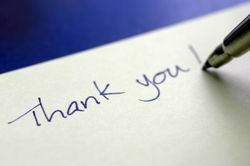 It is also easiest to write a thank you letter shortly after the interview, because the conversation and events are most easily recalled at this time. Write the thank you letter in an appropriate format. For example, a job seeker who has just completed an interview with a large cooperation or bank will need to make sure that the letter is typed, uses professional language, and is drafted on an appropriate letter head. On the other hand, candidates who have applied for a job at a small, family owned beach vendor may neatly hand write their thank you note. After meeting with the staff and discussing the duties of the job during the interview, job seekers will have a better feel for what format their thank you letter should follow. The purpose of the thank you letter is to thank the person or people who conducted the interview for their time and consideration. Sincerely convey your gratitude for the opportunity to be interviewed and for the time that was taken to learn about the skills you have to offer. Additionally, letters could also include a follow-up to a conversation during the interview, or discuss another reason why you would be the best fit for the job opening. Always be sure to prepare the thank you letter as a rough draft before creating a final draft to send in. This way, things like grammar, spelling, and general flow can be modified and improved until the letter is ready to be read by the company. Even if grammar has nothing to do with the skills needed for the job opening, it is important to have correct grammar / spelling. Someone who sends in a thank you letter filled with basic grammatical flaws may present themselves as being uneducated, sloppy, and careless. A candidate who exhibits these characteristics may raise some red flags with the employer, so thank you letters should be as free from errors as possible. During a job interview, employers got a first impression of potential employees. Once the interview is over, you have the opportunity either to improve upon that impression or negatively alter how a company views them simply by writing a thank you letter. These letters help to ensure that you stand out from the crowd of other applicants and further illustrate your particular interest in the company as well. Not only is writing an after-interview letter proper job search etiquette, but sometimes it can be the deciding factor that convinces a company to extend a job offer.